We are based in Milton Keynes, Buckinghamshire and as well as selling a wide range of crystals, minerals and healing jewellery we also run courses and workshops on colour, crystals, numerology and power animals. I also teach emotional intelligence courses and workshops with colour and find that crystals are one of the best tools we have to develop into happy, healthy and brilliant people! I have a degree in psychology and sociology and have been a colour therapist and spiritual healer for several years. Lindon is also a spiritual healer specialising in animal healing. He helps with running the stalls we do at craft fairs, festivals, shows and the parties we run in private homes. We have a wonderful supportive family, our two sons Mathew and Ben and our beautiful daughter Katie and of course not to forget our naughty Yorkie, Sammy!! We have our own online shop, a large ebay shop which has been trading since 2006 and a facebook page to keep everyone up to date on new stock, special offers and the shows we are doing next. We have lots of information pages for you to take a look at including numerology so you can work out your own personal vibration numbers. 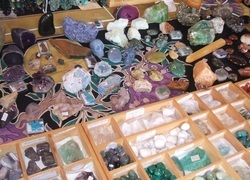 You will notice each crystal listed in the shops has a vibration number and this will give you another way to help you choose the crystals you may need. We will add more information pages so do check back every so often you never know what you might find!